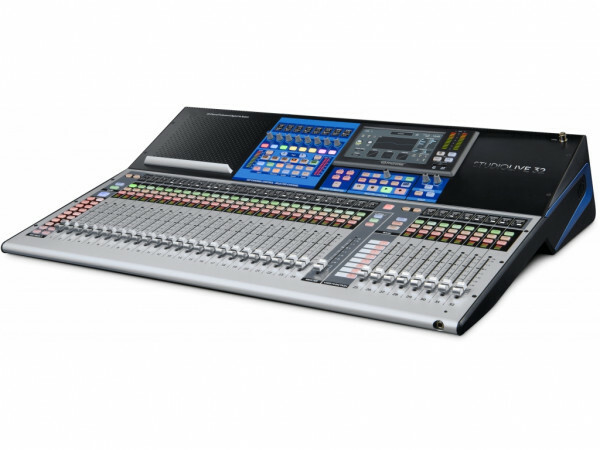 Produktinformationen "PreSonus StudioLive 32 Series III"
The StudioLive® 32 digital console/recorder is by far the most powerful mixer in its class. The result of nine years of R&D, our third-generation StudioLive mixer is fully recallable, with 33 touch-sensitive, motorized faders and 33 recallable XMAX preamps. 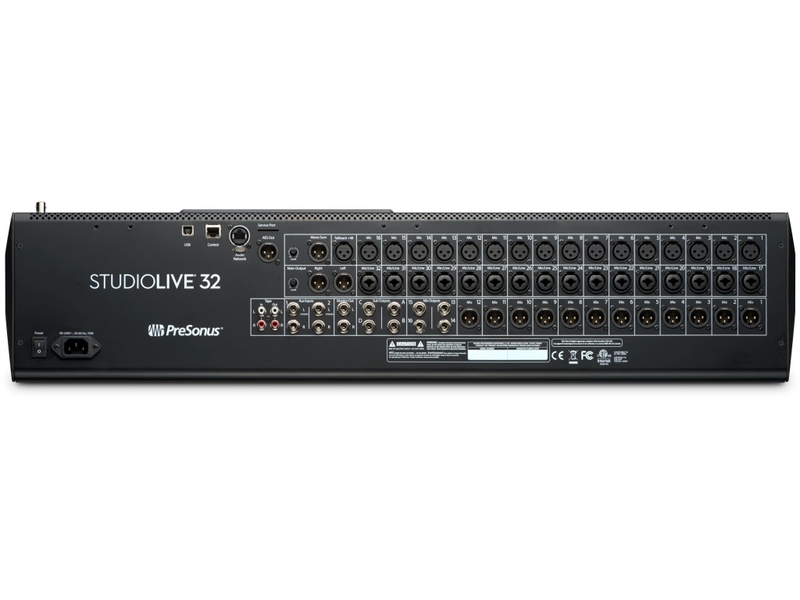 Yet despite its extensive features, the StudioLive 32 actually improves upon PreSonus®' legendary ease of use while letting you customize its workflow and operations to fit the way you work. The coveted StudioLive sound is better than ever, including all-new Fat Channel processing, re-engineered from the ground up, and vintage-style EQs and compressors. Add built-in AVB networking, onboard multitrack CaptureTM recording to SD Card, and a complete suite of software, and you have a mixing and recording powerhouse that's equally formidable in live and studio applications. PreSonus Capture recording software is an intuitive, rock-solid multitrack recording application with virtual soundcheck. It's installed directly into the StudioLive 32 so you can leave your laptop at home. Capture's one-touch recording makes it easy to record to the StudioLive 32's onboard SD multitrack recorder. When you're finished recording, open your Capture session in Studio One® for Mac® and Windows® (included), and the entire mix scene will transfer to your Studio One session, including fader levels, Fat Channel setting, and yes, any drum solos that you may have had to endure that night. StudioLive 32 goes above and beyond in providing ways to customize things to best fit the way you work. User layers for the channel faders let you place any channel or bus fader anywhere you want - and they're easy to set up. But we didn't stop there. How about customizing your Fat Channel layout, putting the parameters you care about most right at your fingertips? There are even several workflow options to personalize your mixing experience. For instance, you can control the mixer with multiple iPads and -optionally- a computer, each running UC Surface with a different view, enabling you to see and touch all of the controls you need at a given time. With StudioLive 32, we've upped the ante and given you more flexibility when working with scenes and presets. Mixer scenes now include Scene Safe, which enables you to protect individual channels from parameter changes when recalling a scene. Similarly, we've expanded the concept of Fat Channel presets so that presets have, for practical purposes, become like scenes for individual channels, not only saving input and Fat Channel settings but also aux send and bus assignments. Of course you can also use preset filters to choose what you want to recall. Don't you hate it when you're setting up for a show and find you have an unused subgroup-but you're short one monitor mix? That's not a problem anymore, thanks to 16 FlexMixes that can be individually designated as aux, subgroup, or matrix mixes. These 16 FlexMixes are in addition to the 4 fixed subgroups giving you a total of 20 mix buses, not counting the main mix and solo buses. We also provided 24 DCAs so you can more easily and flexibly control groups of channels. To top it off, you can choose between 1-to-1 or split-layer workflows: Assign all channels to the top layer, with one fader per input channel, or split the faders between inputs and outputs, including DCAs and aux outputs. These are only a few of the many ways you can customize your StudioLive 32 mixer exactly to your needs and workflow. PreSonus StudioLive 32 mixers are tightly integrated with an entire suite of state-of-the-art software. Mix wirelessly or over a wired network from anywhere, using UC Surface touch-control software for Mac, Windows, and iPad®. Remote control the mixer's recallable XMAX preamps and Fat Channel processing with Studio One Artist for low-latency recording with effects. (Reverb-drowned singers: rejoice!) Completely automate virtual soundchecks and record shows with Capture. Save mixer scenes with your live recordings in Capture and edit both in Studio One Artist. StudioLive 32 mixers and software work together to form a cohesive ecosystem that helps you achieve your creative vision. Networking isn't the future of professional audio systems; it's here now. StudioLive 32 mixers come equipped with an AVB Ethernet connection that enables you to network multiple StudioLive 32 mixers and compatible computers and stream up to 55 channels of audio to and from a Mac or Windows PC. You also get 38x38 recording via USB 2.0, giving you a choice of computer recording methods. Each channel can independently access its analog input or its dedicated digital return from your computer. And recording is simple and easy: Just launch the included, preconfigured Capture software for one-click recording of all channel inputs and your main mix. Or record with the included Studio One Artist DAW-or with any recording software that supports ASIO or Core Audio. A complete ecosystem of AVB solutions, including stageboxes and personal monitor mixers, will be available in 2017. 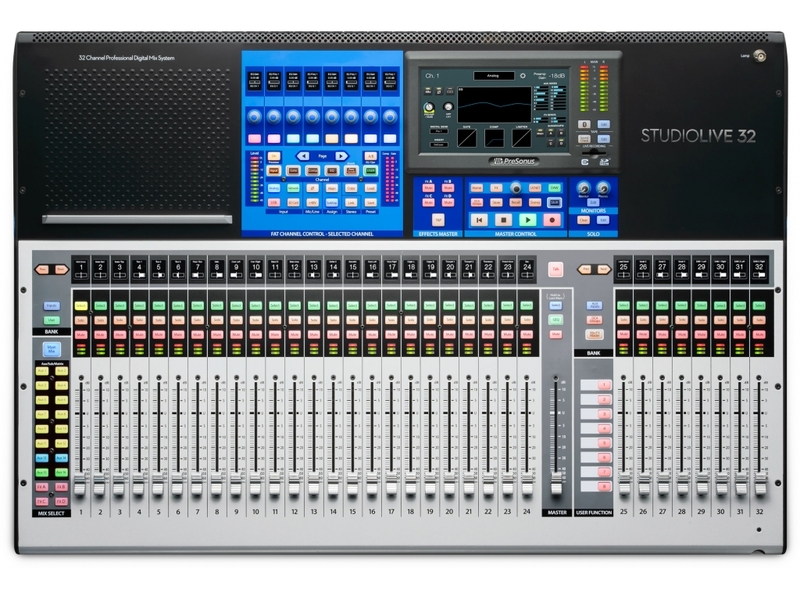 In addition to the AVB recording connection, StudioLive 32 consoles sport a 1 Gb Ethernet port that can connect to a wireless router or directly to a computer, providing remote control of virtually all features. Mix wirelessly or over a wired network from anywhere using UC Surface for Mac®, Windows®, and iPad®. Even add a second-or third, or even fourth!-screen for fast workflow. Musicians can control their monitor mixes onstage with QMix®-UC for iPhone®, iPod® touch, or AndroidTM device without the need for large monitor networks. Go wireless, wired, or both. The back panel of a StudioLive 32 console sports all of the connections you need for live sound and studio production. With flexible connectivity, superior audio quality, the ability to customize for your workflow, and powerful processing, mixing, and routing capabilities, you'll create your mixes in whatever manner works best for you. We just provide the tools. Connect a StudioLive 32 mixer, and you'll instantly hear details and an open high end you'd expect to find only in an expensive studio console. We built our reputation designing great-sounding analog circuits, including our famous XMAX solid-state, Class A preamps, and we put all of that experience into designing the StudioLive 32. We didn't cut corners on components, and we just say "No!" to noisy, crosstalk-y ribbon cables. As a result, the StudioLive 32 delivers the high-end audio quality you need to preserve your hard-earned reputation for producing great-sounding mixes and recordings. Weiterführende Links zu "PreSonus StudioLive 32 Series III"
Kundenbewertungen für "PreSonus StudioLive 32 Series III"